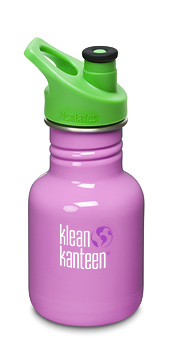 New Colors From Klean Kanteen and the Return of the Klean Kanteen Sippy Bottle! 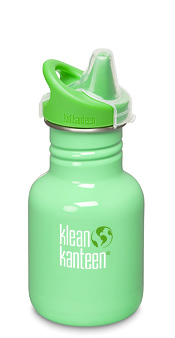 The return of our most popular item from Klean Kanteen, the sippy Kanteen, with a new improved sippy top. “Every new parent wants to make sure their baby’s environment is as healthy as possible. Klean Kanteen® is proud to offer our own Sippy Spout-equipped Klean Kanteen. Every Kid Kanteen® Sippy comes with a polypropylene dust cover and handy attachment loop so it can be hooked on bag or stroller. Head off on your day’s adventure with safe hydration for your little people. The bottle is made from 18/8, food-grade stainless steel that’s totally free of BPA and other toxins. Because stainless steel itself is safe, we don’t need to coat the inside of the bottle with a plastic or epoxy lining, which is one of the main differences between a stainless steel Klean Kanteen and aluminum bottles. The new Sport Cap on an all new line of colors from Klean Kanteen. “It’s arguably most important for kids to stay hydrated and always drink from a healthy, non-toxic bottle. Small and lightweight, the 12oz Kid Kanteen® Sport is the natural progression for kids who are ready for a more grown-up delivery system than the Sippy Cap. The entire cap is BPA-free, super durable and the new soft silicone spout makes the Sport Cap 3.0 safe for new teeth. The cap’s relief valve has been redesigned to be classroom-friendly, no chirping or whistling! The 12oz size is great when space is limited, like for a lunchbox or backpack. It’s the perfect size for water, juice and other drinks. Like every Klean Kanteen®, the 12oz bottle is made from high quality, 18/8, food-grade stainless steel that’s totally free of BPA and other toxins. Because stainless steel itself is safe, we don’t need to coat the inside of the bottle with a plastic or epoxy lining, which is one of the main differences between a stainless steel Klean Kanteen® and aluminum bottles. And it won’t leach toxins or flavors like plastic bottles. This entry was posted in Re-Usable and tagged Klean Kanteen, Sippy Bottle, Sport Bottle, stainless steel by mercantilehighlights. Bookmark the permalink.